If there is one thing to take away from the Naples real estate market it is this; another strong tourist season sold homes but supplies climbed and prices pulled back slightly. Over the last few months we’ve seen some slowing – nothing major, sharp or significant, just a slow and slight pull back. Let’s take a look at individual areas around Naples. There are important variations in sales trends and it benefits our buyers and sellers to know specific trends. 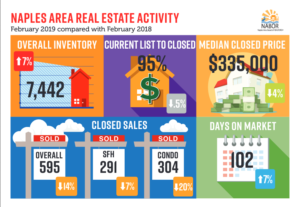 The numbers reflect current inventory or supply levels. A “+” or “-” reflects an increase or decrease in inventory over last month. Twelve months inventory is considered “equilibrium” with no short term price changes. Lower inventories should produce higher future prices, higher inventory prices could cause prices to fall in the short term. What is the point in all this inventory stuff? Inventories differ widely by neighborhood and so should prices in the short term. Buyers and Sellers should do their homework and price AND market and submit offers accordingly!